Envisage a perfect world. Every country would be able to offer its inhabitants acceptable living standards, based on life expectancy, education, income, and gender equality. Envisage the perfect world as a tree. The tree – the world – would feature a strong trunk and healthy branches, holding aloft a canopy of fresh leaves – the countries. Using this tree metaphor, Zolabo has applied data from the UN’s Human Development Index (HDI) to produce a striking and thought-provoking interactive tool representing the varying HDI of countries across the world since 1985. Developed by economist Amartya Sen, the HDI is the ultimate measure by which the living standards of countries are compared (based on life expectancy, education, income and, more recently, gender equality), stimulating debate about government policies and their effectiveness. Screenshot of web app "Tree of Human Development"
At the start of the visualization, a user is asked to set their own worldwide criteria for life expectancy, education, income and gender equality, within defined parameters. 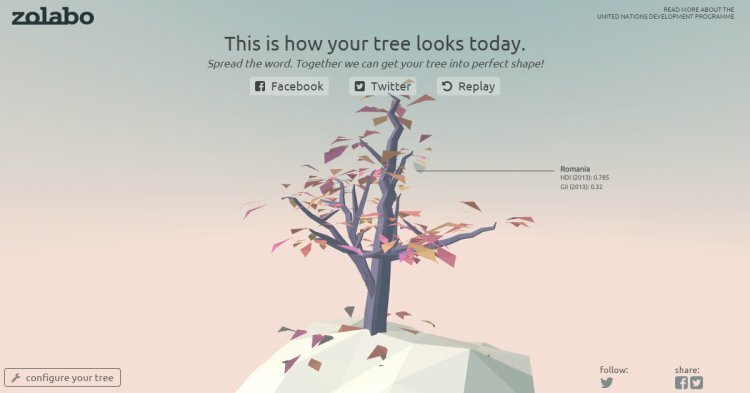 Once this is done, the user is informed which country has the closest HDI to their criteria, then – after selecting their favourite color – he or she is presented with a stunning 3D representation of their ideal tree; healthy and smothered in leaves. Then comes the shock value. The clock turns straight back to 1985 and many, if not all, of the leaves tumble to the ground, leaving the branches of the tree bare; a sobering image, demonstrating how the worldwide standard of living three decades ago was much lower than it is today. As the clock moves forward in time, leaves start floating up to settle on the branches of the tree. Pass your cursor over a leaf and you will learn which country it represents and that country’s HDI and GII (Gender Inequality Index). The shades of the selected color vary across the leaves, to demonstrate which countries have a healthier HDI than others. If you set your criteria high, you’ll be disappointed by how few countries meet those criteria and, therefore, how few leaves are on the tree. If you’re more realistic, your tree will be verdant. Of particular interest are those leaves/countries that float up and down over the thirty-year period, indicative of their citizens’ varying fortunes. Based on quantitative values, this visualization’s strength lies in its capacity to clearly – and beautifully – demonstrate in seconds something that could not be conveyed easily by a dry, indigestible dataset. The rising leaves represent perfectly improvements in worldwide living standards over the past few years, and provide inspiration to those working to bring about positive changes. You can experiment with the Tree of Human Development yourself via the link below. Because Zolabo was founded to inspire learning and exploration, you are very welcome to share the tree with others. Perhaps you have an idea or a project that would benefit from data visualization? Or maybe you simply want to know more about it. In either case, please feel free to contact Jurjen Verhagen or drop by the office. Zolabo is always interested in working (together) on beautiful and ambitious projects.